Prof Sir David Spiegelhalter FRS, OBE gave a talk on Trust in Numbers to the SW RSS local group on the 25th of April. He stressed the importance of statisticians in helping people form critical thinking and that organisations should seek to be trustworthy rather than aimed to be trusted. 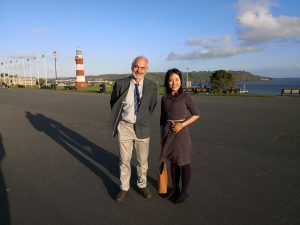 The photo shows the Secretary of the local group, Dr Yinghui Wei, with David on Plymouth Hoe.